Along with all the Kickstarter that are launching this week, there's also several that we're excited to tell you about that are coming up. In this case, it's AEG. They're going all out for this one. They're saying that it's their most ambitious board game project ever. It's got a bit of everything. If you like worker placement, it's got that. If you like deck-building, it's got that. If you like card crafting, it's got that. It's called Edge of Darkness. On February 20th at noon (EST) Alderac Entertainment Group will launch the Kickstarter for the most ambitious tabletop game it has ever published. That game is titled Edge of Darkness. It is designed by John D. Clair, designer of the ORIGINS Award Winning Mystic Vale. Graphic design and primary illustrations by Alayna Lemmer-Danner. 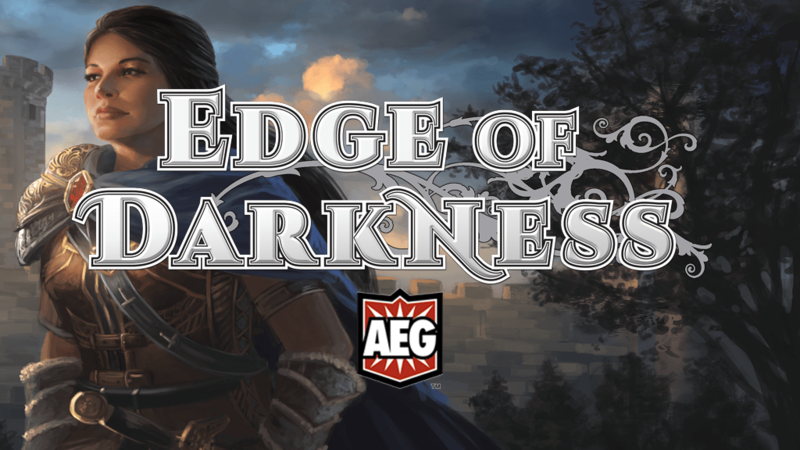 Edge of Darkness is a medium-weight game for 2 to 4 players featuring card crafting, worker placement, shared deckbuilding, and a cube tower Threat system. The game is modular to provide extensive replayability. In Edge of Darkness players take the roles of leaders of powerful Guilds inside a City beset by powerful evil forces determined to destroy it, known collectively as The Threat. The City exists in the same world as Mystic Vale, although in a different region of the world. The players must compete for resources and attempt to exert control over the various critical areas of the City in order to build support within the City while defending against the attacks of The Threat. The game is played in rounds, and ends after a set number of rounds have passed. The winner is the player that has amassed the most Victory Points.